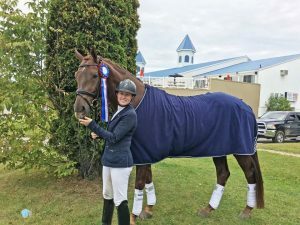 Rhegan White said: Proud of my Westfalen Beaujolais v. Bordeaux/Furst Piccolo who scored 78% as a highlight of the weekend to confirm his position as Eastern Canadian Dressage Champion in the Open Training Division! Thank you so much, trainer Belinda Trussell and rider Lynsey Rowan and vet Usha Knabe for helping my boy become the superstar I always hoped he would be. We have come a LONG WAY through lots of trials and tribulations - this is so rewarding for all of us on team Belinda Trussell International!